During a recent meeting I was asked to explore the possibility of presenting existing PDF newsletters in a flipping book format. You know the sort; online interactive magazine layouts presented as a 3D book, where pages are navigated to and animated in a realistic flipping motion. This wasn't new ground for me as I'd already completed the exercise (and dismissed them in favour of PDF) 5 years ago, but the topic had raised its head again, and this time it was interesting to relook at things from a mobile-friendly perspective. ... where they re-create a physical something in digital form and thereby replicate all its weaknesses; plus, since you can't truly replicate everything you introduce new weaknesses. In this case for example, users can't fan through multiple pages to skim to what they want. The result is you're creating advanced technology to make something that is less usable than the original technology it replaces. The idea is apparently to use a magazine metaphor so users will know how to interact with it. Users know how to flip pages in a magazine, so they'll know how to flip pages in this digital replica. Theoretically, this would be good for someone who is totally unfamiliar with computers. However, if they have to get to this document by going through conventional web pages, then they must already know how to click and scroll, so they're getting no benefit from the capacity to flip pages like a magazine. But, for others - those who may not necessarily understand how the web works or who have not necessarily considered where and how visitors access content - there is still much appeal in the visual "WOW" that an animated online booklet offers. And therein lies the problem. Unfortunately, there's an inherent problem with the way executives are involved in Web site design. Given that the site is crucial to your organization, naturally your input is solicited. But because of the way sites are developed, all you're really asked to comment on is the appearance ... the only thing you can reasonably judge is "Does it look good to me?" and "Does it create a good impression?" As a result, CEO's almost always push for something that's more visually appealing, something with more "pizzazz" or "sizzle". The problem is that except in a few cases ... Web sites don't really need much sizzle. Most of the time on the Web, people don't want to be engaged; they just want to get something done, and attempts to engage them that interfere with their current mission are perceived as annoying ... Attempts to add sizzle almost always get in their way. Unless your site gives people the information they want and makes it easy for them to do what you want them to, the main thing it's doing is announcing that you're either clueless about the Web, or you care more about your image than you do about them. The moral is, you can do as much as you want to make your site look good, but only if it's not at the expense of making it work well. And most sizzle gets in the way of it working well. At the end of the day, it usually falls to the web team and / or marketing people to decide if a flipping book is a superficial flourish or a worthwhile and effective means of distributing content. Flipping books – web-based or desktop software? Looking at what's currently out there, page flipping softwares come in 2 flavours – web-based and desktop software. I dismissed the web-based ones almost immediately due to on-going monthly costs; as they require a subscription to the provider's service, and because the software is held on someone else's website, with the flipping books being hosted on someone else's servers, it's a way of keeping you permanently tied-in. Most flipping book providers I looked at prevented the final product from being downloaded (as a working flipping book) for personal safekeeping or hosting on another website, so concerns would be, if the company went under, or if you wanted to go elsewhere, would you lose all access to, or use of, old flipping books? At that point there'd also be additional cost / time in researching alternatives, setting up alternatives, and training, not to mention the disparity between 2 different final products and end-users potentially dealing with 2 different interfaces. There are no doubt many more reasons but I didn't go further as this option had already been swept off the table. Each flipping book is a collection of dozens and dozens of scripts, files and folders, which together make it possible to view (variations of) the flipping book on mobiles, tablets and desktop computers. These take up a lot of space. For example, a test document in PDF format was only 5MB in size when optimised for the web. I turned it into a flipping book and the weight soared to 36MB+... and that was only on a 10-page restricted conversion owing to limits of the trial software. I would expect a full 20+ page publication to be considerably more... maybe 10 times the size of the PDF. Consider too that we're not just talking about the size of each flipping book in relation to space occupied on the server, but also by the weight and amount of files each web-visitor has to download in order to view each flipping book on their device. The extra weight could really chomp through data usage allowances on mobile. The scripts, files and folders that make up each flipping book, come as a bundle and have to be transported together. A flipping book isn't (for the most part) something that could easily be emailed out in a standalone version. It is true that some software outputs a standalone .exe file, but in order to transport it over email, it would need to be zipped-up to bypass anti-virus / spam protection, or whatever unknown malicious threat prevention measures that the user (or the organisation) has in place on their system; cue additional usage instructions for the recipient on desktop, and frustration on mobile when they realise that they can't view the .exe on the go, forcing them to wait until they're back at a desk. The most accessible flipping book could therefore only really exist on a website. On the other hand, you could simply distribute a PDF – that stands for Portable Document Format, so the clue is in the name. You would be at the mercy of a website person to upload all of the necessary scripts, files and folders online, embed it into a web page, link it in menus and provide access links that can be emailed out, for every flipping book. It's impossible to predict whether the desktop software used to create the flipping book, will work on future computers, leading to further upgrade costs. Similarly, there's no way of knowing if the scripts will be compatible with future web browsers, or if flipping books generated today will work in all future devices, leading to a need to rebuild them all later down the line to accommodate any new technology. And not just by the person using the desktop software, but by web visitors too. There are several sorts of flipping book softwares on the market, and each one generates a different flipping book interface. That's a new interface and new set of buttons, and behaviours, for new users to learn how to use, and an interface and set of behaviours for occasional users to relearn how to use. On mobile, depending on software, pages can scroll down, swipe left, tap, or be navigated to via a menu. There's more expenditure of brainpower as visitors encounter other flipping books on other websites, and this required extra thought can erode a user's confidence both in the website and it's providers. See Krug's first law of usability, "Don't Make Me Think!". Compare that to PDF - all PDFs everywhere behave the same and conform to existing learned expectations (users know how to scroll down) so they take less effort to use. Flipping book softwares have been around since before mobiles, and only a few have been converted to work on mobile in an attempt to move with the times and make mobile experience (of the interface – not the text, which is still tiny) more comfortable. But it is only the desktop version that has the "WOW" factor – mobile adopts a more simplistic view. The problem there is that, globally, mobile usage now surpasses desktop usage, and it's still growing, so it's a trend we can't ignore. The visual "WOW" factor on desktop will simply not have chance to "sell" the all-singing, all-dancing version of the flipping books to a growing number of people. Flipping books, as a way of distributing content, is also a falling trend. 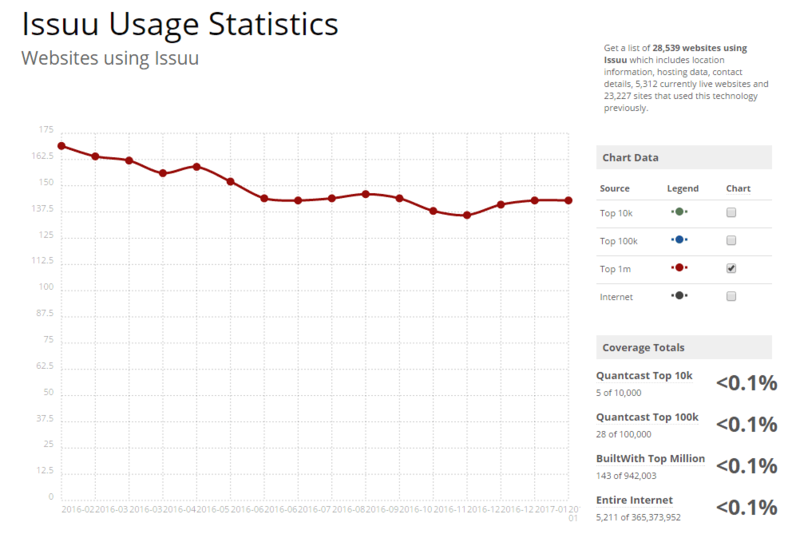 Take, for example, statistics for Issuu (one of the largest online publishing sites that uses flipping-page technology) – usage amongst the top 1 million websites has fallen over the past year. I would guess at this being partially linked to publishers finding alternative ways to distribute their content (e.g. reading Apps), following the move by Google in April 2015 that has since penalised websites for delivering content that is not mobile-friendly. The "WOW" factor is there only for as long as the (desktop) web-visitor is looking at the online flipping book. Is it realistic to expect web-visitors to stay on the site and read the flipping book cover-to-cover, where they can continue to be impressed by the flipping animation? Or, is it much more likely that visitors will take the PDF version away with them to read at a more convenient time; Maybe offline, having been imported into iBooks or Pages; Maybe by emailing it to themselves? And are people more likely to email the PDF, which cannot change or disappear once it's in a user's possession, or, email a link to the web page where the flipping book is located, which could be removed or changed before they have chance to get back to it? The PDF would win because loss-aversion (fear of losing something) is a more powerful motivator than the gains of a pretty page-flip effect. The number of PDFs I'm personally sent for inclusion on the websites I maintain, rather than links to online publications (flipping or otherwise), would support this. At the end of the day, a PDF, while not the fanciest medium on its own, is much more useful, user-friendly, portable, stable and predictable than an online flipping alternative. Still, PDF doesn't come free from it's own usability issues, namely the fixed-size layout that has to be shrunken down to fit on small screens, which is the same fate the flipping book falls victim to, minus the overhead (and uncertainties) of all those extra scripts, buttons and behaviours. This is where responsive web design (RWD) trumps both as a superior content delivery mechanism because it allows web pages to be viewed in response to all devices and screen sizes, without downsizing a static layout, or the text within it, to teeny weeny proportions. So those are my reasons why flipping book solutions might not be the right choice. Sometimes they might be, but it is important to weigh up the pros and cons and understand the impacts in each use-case. The decision is yours.